Cool down this summer with some creative and educational fun in the sun! All of these water-based activities are perfect for a hot afternoon. You don't need a pool to enjoy most of these games, either. Kids will love the opportunity to throw on their swimsuits and gather in the backyard for some DIY-water-park-fun! Like SCUBA, but without the training! Explore the depths of a pool, lake, or even the ocean with a DIY underwater viewer, perfect for looking at tide pools or playing diving games! 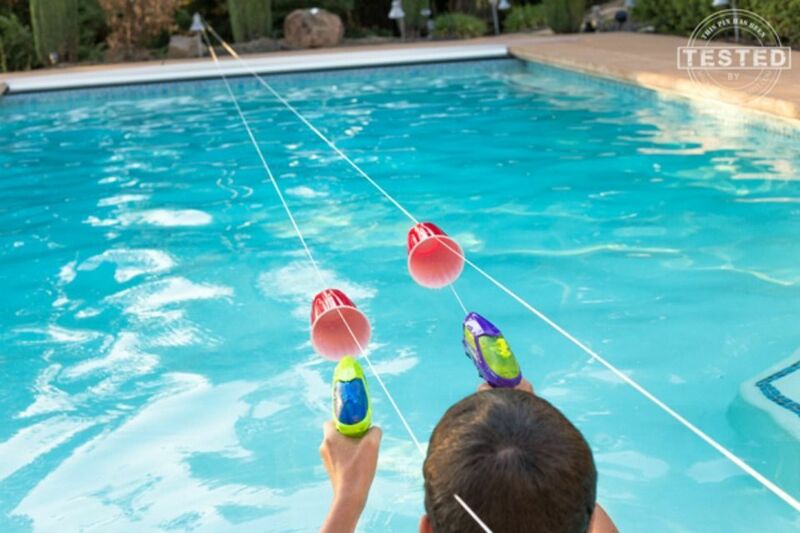 The two best summer activities finally combined for a backyard game of splash-filled fun! Perfect for the dog days of summer. Are you more a basketball than a baseball family? The good news is that water balloons are fun in any classic sport! Try water balloon basketball and make a splash on the court! Water tables are an old standby, especially for the younger crowd. It's endless playtime that's easy to put together and clean up! Rotate between these 3 unique ideas to keep your kiddos entertained all summer long. Surprise your kids with this AWESOME water blob! Get ready for hours of fun with this water activity. This is a super cute craft, perfect for toddlers. Make some easy sponge boats that actually float! Great for a kiddie pool, the beach, or even bath time! This game is so sweet and so easy to set up. Let your little ones play pretend with a backyard fishing pool and get creative with different kinds of wacky fish! All the materials needed for this game are already in your house. Spend an afternoon tossing a sponge around in a take on the classic "hot potato." This is the perfect game to break out during a backyard party. We love how original and fun this game is, and how easy it is to make! The stakes are high in this water balloon toss with as many water balloons as you can manage! Spend an afternoon as a family playing this towel toss game and see who gets soaked first! What kid doesn’t love bubbles? How about GIANT bubbles? With this DIY backyard bubble activity, kids can make bubbles as big and tall as themselves, sure to be a hit with any curious child! With just some non-toxic watercolor paints or food coloring, this backyard DIY is a super creative way to get your kids making some beautiful art this summer! Try this activity for kids who love sensory play. Make your own gutter-river in the backyard and let the little ones play for hours sending boats down the current! Get even more creative with your backyard bubbles with some bubble snakes! Add a bit of food coloring for some extra fun. If you’ve seen the balloon powered toy car craft trend, this is the next step up! For summer, make some sweet balloon powered sponge boats for playing outside in a water table, kiddie pool, or even the bathtub! Send summer fun flying with this water balloon parachute idea! If you’ve got a treehouse or play structure in your backyard, this is the perfect water activity for you! On a really hot day, this is the perfect activity to break out with the kids. Freeze some cute toys into fun shapes the night before, then set up the kiddie pool and let your kids play for hours while learning a bit about science! What better way to cool down than with an organized water obstacle course? These are great ideas for setting up a whole afternoon of friendly competition! Help your kids learn about the flow of water with this cute lego building water activity! Perfect for an outdoor water table!